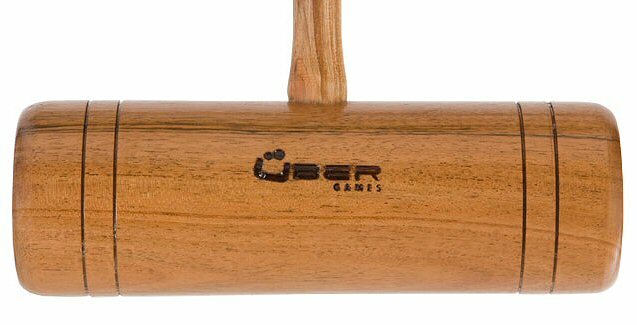 Executive Croquet Mallet from Uber 38” with Octagonal Multi Ply handle, 9” x 3” Hardwood Head, Natural finish, Leather grip, Approximate weight 3lbs. 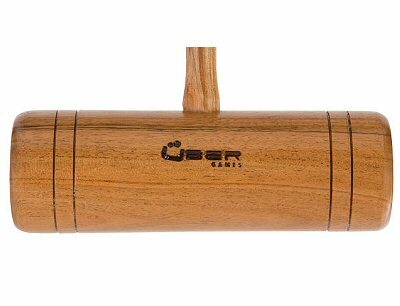 This is the Mallet supplied with our Uber Pro 4 & Pro 6 Croquet Sets. The Pro Mallets are remarkably good for the price - they have solid octagonal-section handles, profiled so that they flex in just the way you would want them to. All in all, our Pro Croquet mallet really is a very good buy. Uber is a UK manufacturer of croquet equipment. For many years there were two types of croquet set - good quality sets at a very high price, and poor quality sets at a lower price. Thankfully, this situation is changing as some really quite impressive sets at very good prices are becoming increasingly available, broadening the appeal of croquet. Our Uber Games range of croquet sets and accessories is a very good example of this. What these croquet sets do so well, is to put the quality where you need it most - in particular mallets and balls. Get these two right, and you'll have a great time playing croquet.